On Monday 20th June, 2016 the Governor of Ekiti State, Ayodele Peter Fayose, alerted the nation that his personal bank account domiciled with Zenith Bank of Nigeria Plc has been frozen by the Economic and Financial Crimes Commission (EFCC). Mr. Fayose excoriated the anti-graft agency and the Federal Government of Nigeria for taking such “illegal” and “criminal” action without reference or regard to the immunity clause in the Constitution which protects him during the currency and subsistence of his tenure as the Executive Governor of Ekiti State. In his response, the Spokesman for the EFCC, Wilson Uwujaren told Vanguard Newspaper that the anti-graft agency has the right to investigate any governor whose account is being used to move funds. “Immunity does not prevent EFCC from investigating suspicious accounts of those enjoying immunity and Fayose cannot be an exception, “Mr. Uwujaren said. Before delving into the substance of this legal controversy, it should be noted from the beginning that this essay is strictly aimed at dissecting the constitutionality or otherwise of the freezing of the bank account of a sitting governor by the EFCC. The temptation to meddle into any alleged, conceivable or ostensible political undertone in the matter will be resisted. I need to also caution that this piece requires patience and clarity of thoughts, devoid of emotions and sentiments for proper digestion and comprehension. The issue at stake deserves a detailed examination. 1. Whether the EFCC have the powers under the law to freeze the bank account(s) of persons who are under criminal investigation by the commission? 2. Whether a sitting governor of a State in Nigeria can be investigated for alleged crimes, and his bank account(s) frozen by the EFCC in the course or under the pretext of criminal investigation? The answer to issue 1 supra (above) is found in the Economic and Financial Crimes Commission (Establishment) Act 2004 (subsequently referred to as the EFCC Act). In recognition of the serious nature of economic and financial crimes, the National Assembly vested the EFCC with far reaching powers to enable the commission discharge its mandate of ridding the country of corruption. Among the powers conferred on the commission as part of its general investigative powers, is the power to freeze the bank account of persons who are subject of investigation by the commission. The above provision is self-explanatory. For emphasis, I will elucidate on two principles arising from the provision. Firstly, the EFCC Chairman or any other officer of the commission authorised by him can order any financial institution (including Zenith Bank of Nigeria Plc where governor Fayose’s account is domiciled) to freeze any account with money which he is satisfied is made through the commission of an offence under the EFCC Act, the Money Laundering (Prohibition) Act, etc. Satisfaction within the contemplation of this section is entirely a matter of opinion which may be formed based on the existence of certain facts and circumstances that are within the knowledge of the chairman of the commission. The Act has not set out any condition that should guide the chairman in determining which account to freeze. In other words, it is a matter of discretion whether any account should be freezed or not. All that is required of the chairman is for him to be satisfied that the money in the account is a product of crime and corruption. The second principle that deserves reiteration is that before the chairman of the commission can order a financial institution to freeze any account, he must first apply to the Court ex-parte (without the attendance of the owner of the account or the financial institution in court) for power to issue the order. Simply put, an application to the court for power to freeze an account and the granting of same, are conditions precedent to the issuance of an order to freeze under Section 34 (1) of the EFCC Act. At the risk of repetition, I submit that the EFCC has no power to order any financial institution or designated non-financial institution to freeze any account without obtaining the consent of the Court. Provided that in ascertaining whether any period of limitation has expired for the purposes of any proceedings against a person to whom this section applies, no account shall be taken of his period of office. (2) The provisions of subsection (1) of this section shall not apply to civil proceedings against a person to whom this section applies in his official capacity or to civil or criminal proceedings in which such a person is only a nominal party. (3) This section applies to a person holding the office of President or Vice President, Governor or Deputy Governor; and the reference in this section to “period of office” is a reference to the period during which the person holding such office is required to perform the functions of the office. In view of the above constitutional provisions, can Mr Fayose be investigated by the EFCC for commission of an offence under the EFCC Act, the Money Laundering (Prohibition) Act or any other law that is within the investigative or prosecutorial authority of the commission while he is still the governor of Ekiti State? This question was answered emphatically in the affirmative by the Supreme Court of Nigeria in the celebrated case of Fawehinmi v. Inspector General of Police (2002) 7 NWLR (Pt.767) 606. The brief facts were that the late renowned human rights lawyer, Chief Gani Fawehinmi SAM SAN, by a letter dated 21st September, 1999 brought a criminal complaint against the former governor of Lagos State, Senator Bola Ahmed Tinubu, alleging grave criminal infractions and asked the police to investigate the allegations. Following the refusal by the police to accede to his request, Chief Gani filed an originating summons on the 7th of October, 1999 at the Federal High Court, Lagos wherein he sought among others, an order of mandamus compelling the Inspector General of Police, the Commisioner of Police Lagos State and the Nigeria Police Force (respondents) to investigate his allegations. The suit was dimissed by the Federal High Court following a preliminary objection by the respondents on the ground that by virtue of the immunity provisions in Section 308 of the Constitution, Tinubu who had assumed office as the governor of Lagos State could not be investigated on the said allegations. Dissatisfied, the appellant challenged the judgment at the Court of Appeal. In its judgment, the Appeal Court held that Section 308 of the Constitution does not protect a governor and the other persons covered by it from criminal investigation. However, an order of mandamus was refused. Still dissatisfied, Gani approached the Supreme Court on the issue of mandamus. The respondents (the police) on their part filed a cross appeal against the part of the judgment of the Court of Appeal which declared that immunity does not cover investigation. “That a person protected under section 308 of the 1999 constitution, going by its provisions, can be investigated by the police for an alleged crime or offence is, in my view, beyond dispute. To hold otherwise is to create a monstrous situation whose manifestation may not be fully appreciated until illustrated. I shall give three possible instances. Suppose it is alleged that a Governor, in the course of driving his personal car, recklessly ran over a man, killing him; he sends the car to a workshop for the repairs of the dented or damaged part or parts. Or that he used a pistol to shoot a man dead and threw the gun into a nearby bush. OR THAT HE STOLE PUBLIC MONEY AND KEPT IT IN A PARTICULAR BANK or used it to acquire property. Now, if the police became aware, could it be suggested in an open and democratic society like ours that they would be precluded by section 308 from investigating to know the identity of the man killed, the cause of death from autopsy report, the owner of the car taken to the workshop and if there is any evidence from the inspection of the car that it hit an object recently, more particularly a human being; or to take steps to recover the gun and test for ballistic evidence; and generally to take statements from eye witnesses of either incident of killing. OR TO FIND OUT (IF POSSIBLE) ABOUT THE MONEY LODGED IN THE BANK or for acquiring property, AND TO GET PARTICULARS OF THE ACCOUNT AND THE SOURCE OF THE MONEY; or of the property acquired? The police clearly have a duty under section 4 of the Police Act to do all they can to investigate and preserve whatever evidence is available. The evidence or some aspect of it may be the type which might be lost forever if not preserved while it is available…” (Emphasis mine). In the instant case, does the freezing of the account of Governor Fayose fall within the investigative powers of the EFCC or is it illegal as declared by Fayose? Since investigating a governor is permissible, does an application to the court for power to freeze the account of a governor under Section 34 (1) of the EFCC Act violate Section 308 (1) (c) of the Constitution which states that “no process of any court requiring or compelling the appearance of a person to whom this section applies, shall be applied for or issued”? The answer is indisputably in the negative (it is “Capital No”). This is because the law expressly states that the application should be made in the absence of the owner of the account, that is, ex-parte. If the EFCC seeks to freeze the account of a governor, there will be no process requiring or compelling the attendance of the governor since same is ex-parte and not on notice. Therefore, Section 308 (1) (c) is neither applicable nor violated in any way. Freezing of accounts serves principally two purposes. First, by freezing a suspect’s account, the commission prevents the suspect from accessing, operating and drawing money from the account which may ultimately be forfeited to the government if the suspect is eventually prosecuted and convicted. Immunity clause cannot prevent the EFCC from securing and preserving monies found in the account of a governor provided the Chairman of the EFCC is satisfied that the money is proceeds of crime. Second, the money is freezed for preservation and use as evidence during trial. From the foregoing, it is clear that there is no provision in Section 308 of the Constitution that is offended by the freezing of the account of a governor. There is no argument about the fact that freezing of bank accounts of persons who are under criminal investigation is merely an interim, precautionary and necessary step preparatory to arraignment and prosecution. Interestingly, an illustration was given by Justice Uwaifo J.S.C. (as he then was) in Fawehinmi’s case of an instance where it is alleged that a governor “STOLE PUBLIC MONEY AND KEPT IT IN A PARTICULAR BANK”. His Lordship in his prophetic wisdom rightly stated that a “monstrous situation” will be created if the police (in this case the EFCC) is unable “TO FIND OUT (IF POSSIBLE) ABOUT THE MONEY LODGED IN THE BANK” or “AND TO GET PARTICULARS OF THE ACCOUNT AND THE SOURCE OF THE MONEY”. 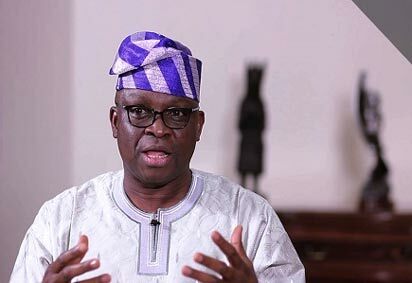 According to an online newspaper, Sahara Reporters, “Sources at Nigeria’s premier anti-corruption agency, the Economic and Financial Crimes Commission (EFCC) have revealed that a personal account at the Zenith Bank of Nigeria of Ekiti State Governor, Ayodele Fayose, was frozen in connection with over N1.2billion he took in 2014 from the disgraced National Security Adviser (NSA), Sambo Dasuki, to prosecute his re-election as governor.” If this was the basis upon which the EFCC Chairman became satisfied that the money in Fayose’s bank account is/was made through commission of an offence under the EFCC Act or other applicable laws, nobody can question him, except the court. Governor Fayose has not been invited for interrogation by the EFCC; he has not been arrested or imprisoned; no criminal proceedings has been commenced against him, and clearly no process of court requiring or compelling his attendance in court has been issued or applied for. These are the only things and actions that Section 308 of the Constitution forbids. The Supreme Court in Fawehinmi’s case supra declared that a governor can be investigated in any manner, provided it does not lead to any these limited situations. The Apex Court emphasised that these limited situations must not be extended under the guise of liberal interpretation of the Constitution. The question then is? Has any of the protections given to Governor Fayose by Section 308 of the Constitution been taken away by the EFCC? However, the EFCC must exhibit an order of the Court that empowered it to freeze Fayose’s account. In the absence of such authorisation, the action is illegal, ultra vires, oppressive, undemocratic, null and void and of no effect whatsoever. If the condition precedent was not complied with, the account should be de-freezed immediately without delay with an apology to the governor. Fayose has the right to seek legal redress in the absence of an order of the court. In the case of Mobil v. LASEPA (2003) 104 LRCN 240, the Supreme Court held that failure to comply with a condition precedent is fatal and renders an action a nullity. One does not need to be a lawyer to know that law enforcement agencies, including the EFCC, in the course of investigation of crime usually and are legally empowered to take possession of material evidence. Freezing of a suspect’s bank account is undoubtedly an integral part of the investigation process and procedure. If it were not so, Section 34 (1) of the EFCC Act would only been invokable when a charge or an information has been filed. I submit however that the Court has the supervisory jurisdiction to examine, review and or revoke any freezing order issued by the EFCC chairman depending on the circumstances and the justice of each case. The order itself it interim in nature and not absolute or perpetual. As a postscript, I further submit that any reference to the immunity clause in Section 308 of the Constitution that is outside the limited protection in the express provisions of that section is legally indefensible and baseless. The President, Vice President, Governors and Deputy Governors only enjoy limited immunity. There is nothing dictatorial, “illegal” or “criminal” in investigating a governor for alleged offences. Let it be known that immunity is not a license to commit crimes or engage in wanton corruption. Section 308 of the Constitution only offers limited protection. It was never the intention of the framers of the 1999 Constitution for the clause to be exploited as a weapon for impunity, executive lawlessness and self-enrichment.